Numerous times, my wife Joyce and I have been able to see and visit what could be ‘Satan’s throne,’ if the devil does in fact have a physical throne on the earth. The last time was this year. The first time we saw it was back in 1987 on a tour of Saint Peter’s Basilica in Vatican City. Those of on that tour (all WCG members) were told by a Worldwide Church of God minister who was conducting the tour that Joseph Tkach, Sr. (who was then the Pastor General of WCG–he died in 1995) stated that he felt that this was “Satan’s throne.” The WCG tour guide minister also said that that there was a tradition/legend (which possibly can be tied to one interpretation of the 12th century Malachy prophecy) that the final pope would sit on this throne. Now, I agree that the current pope Francis (who could be the last pope and is the one following #111 on the Malachy list) may or may not chose the name Peter II or anything similar–but that does not mean that he could not fulfill that prophecy. It needs to be clear, whether the pope does or not pick that name, the final major pope will be a destructive antipope. Malachy’s list did not actually name pontiffs, but basically gave short descriptions. And while some have concluded that Petrus Romanus is a name, it could be a description. The description could signify that he is a pebble (or “rocky” which is what the term petrus signifies) supporting the final Roman empire. 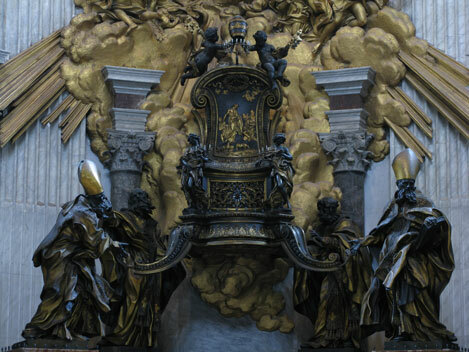 If this Cathedra Petri (or the one in the Basilica of St. John Lateran) is moved to area of the Church of God in Jerusalem’s Western Wall (commonly called the Cenacle), it is possible that it could fulfill some of the above prophecies. We will see. This entry was posted on Friday, June 13th, 2014 at 3:01 pm	and is filed under Church History, Religious News.